Before we found and bought Serenity we had made plans with our friend and OCSC instructor, Bill Kinney, to spend a month sailing to the Channel Islands in southern California. Initially the plan had been to sail to Hawaii and back, but as we were unable to get enough people committed to make it cost effective we went with the Channel Islands instead. The Channel Islands are a chain of eight islands off the California coast stretching from Point Conception to 75 miles west of San Diego. 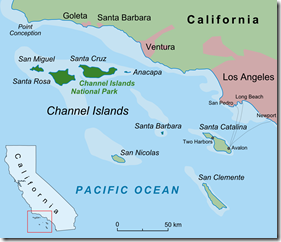 The northern islands, San Miguel, Santa Rosa, Santa Cruz, and Anacapa, as wells as Santa Barbara (the northern most of the southern islands) are part of the Channel Islands National Park. A permit is required for landing, and anchoring, except for Santa Cruz, where one can go ashore in the eastern half and anchor anywhere. The other southern islands are Santa Catalina, San Clemente, and San Nicholas. Clemente and Nicholas are both used and controlled by the U.S. Navy. Catalina, on the other hand is the only really populated island. It is the most frequent destination in the island chain, with a ferry to and from the mainland, and several favorable harbors including the famous Avalon (not to mention infamously expensive). After a whirlwind week of making an offer on Serenity, attending the wedding of our friends Nathan and Nicole, brewing beer, and provisioning for the trip, we were finally ready to depart. The morning of our departure we awoke to a cool, calm morning at the Marina Bay Harbor in Richmond. We motored out as the pink glow of dawn reflected on the water and slowly warmed to the golden light of morning. The early morning view of the city was crystal clear and beautiful. As we approached the Golden Gate however, the stereotypical San Francisco fog was rolling in swallowing the bridge and passing tanker ships as we approached. It was a stunning beginning to our trip. Coast Guard: Can you describe your vessel? LV: Our GPS and our fish finder took a dump. CG: What is your depth? CG: Can you see anything? LV: We can see the shore. CG: How far away are you? LV: About 1 to 1.5 miles. CG: So this morning did you go north or south? CG: What was the last thing you saw? 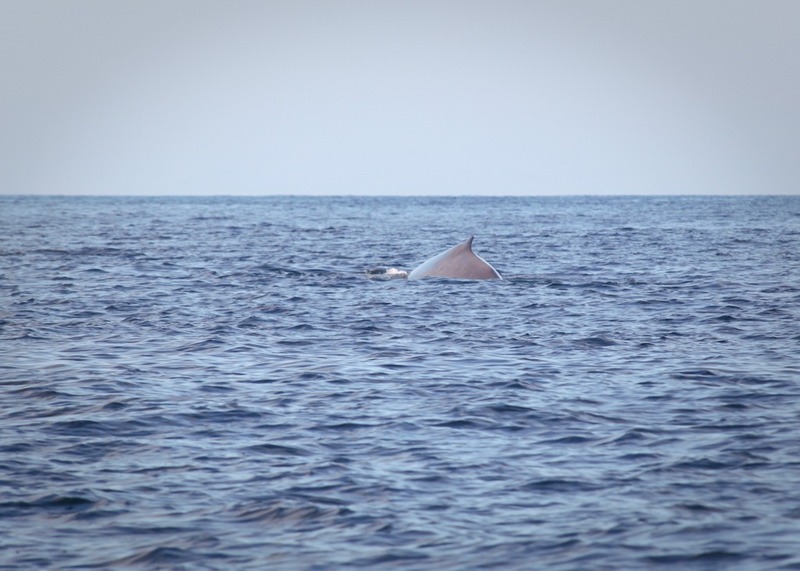 On September 14th, after three days at sea, we approached Point Conception. We were finally able to sail with all sails drawing well. 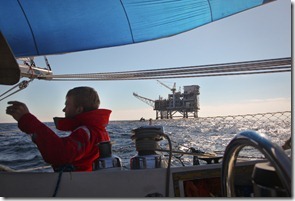 The labors and reduced pace of sailing are infinitely preferable to the clamor, rattling, and fumes of motoring. It was especially unpleasant when the exhaust system failed and filled the cabin with diesel fumes. Jen and I had been napping below when it happened, and I’ll spare you the description of the gunk coming out of our sinus passages for the next few hours. Luckily Bill was able to jerry rig a fix once the engine cooled down. As we rounded the point, slipping past hulking oil rigs, we discussed our course. At first we were trying to decide between visiting one of the northern islands for some period, or heading straight to Catalina and hitting the northern islands on the way back. We were all tired and even the closest anchorage was over a days sail away, so none of the options really stood out in our eyes. But then Bill had an epiphany: Cojo Point. An anchorage just east of Point Conception, it was most commonly used by ships waiting for calm weather before heading north. 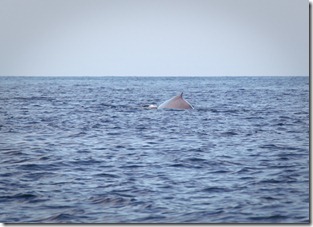 After checking the details in the cruising guide it was unanimously declared a winner. As we approached we were undeterred by the ominous visage of two small sailboats that had be blown up on shore some time ago. We reassured ourselves that they had probably foolishly anchored on 3:1 scope in a southwester, and we had nothing but fair weather ahead. We arrived just before sunset, and as we positioned to anchor I couldn’t help but notice the small but well formed shoulder of the waves wrapping Cojo Point. As soon as the hook was secure I was changing into my wetsuit, shrugging off “you’re crazy” looks from Jen, and jumping off the boat. The session was awesome. The rides were short, but the conditions were very clean. There was a thick kelp bed outside the break smoothing things out, and combined with the offshore winds, the set waves turned into perfectly sculpted waste high right-handers. I think I was smiling ear to ear when I paddled back to the boat, to enjoy a delicious dinner prepared by Jen and a rum nightcap.